ORLANDO, Fla. — On the days leading up to June 12, dozens of Latino families face the one-year mark of one of the nation's worst mass shootings. The Pulse shooting took place during the club's Latin night. Forty nine people died, dozens were wounded. Most were Latinos. One of them was Amanda Alvear. She was 25. Amanda Alvear, who was of Puerto Rican descent, was a happy nursing student who also worked as a pharmacy technician. Alvear described her daughter as fierce and fearless. She was the youngest of three and despite being the only girl, she did everything her brothers did. Alvear fondly recalled a time period where they lived in the U.S. Virgin Islands and she’d watch her daughter jump off of 20-foot bridges into the ocean with her brothers. “She loved competition. We were identical in that. She always beat me,” she told NBC Latino, smiling at the memory. Mayra Alvear, at center, with her late daughter, Amanda, at left. Alvear had already lost her 12-year-old son, Nelson Alexander, to cancer sixteen years ago. She never imagined that she would experience such pain and loss ever again, until the night of the Pulse shooting. “You feel numb. You feel but you don’t feel. You start reacting little by little. Then, there’s this pain. Your heart breaks into pieces," she said. Alvear describes the last year as a roller-coaster; her husband underwent several procedures for heart disease. But like many in the community, Alvear has overcome shock after shock and channeled her energy into outreach. Alvear decided to join a group in the nearby city of Kissimmee, about 25 miles south of Orlando, where she met five other mothers who had lost their children at Pulse. “Their pain is my pain,” Mayra said, of the therapy sessions they hold. Alvear joined a task force on Pulse and works on educating those around her about the area's LGBTQ+ community. She insists more tolerance and education is needed, “This isn’t something you look for, you are born this way.” Mayra is a very devout Catholic but has visited different churches and said churches should be more accepting and the LGBTQ+ community needs to be more willing to attend church because their relationship is with God and God loves everyone. Alvear's work in the community is what helps her get out of bed every morning. “If I don’t do anything I don’t think I could overcome the immense pain of losing my soulmate, my daughter." Latino organizations and LGBTQ groups both existed in Orlando, but there wasn’t an organization that worked with both communities at the same time. In recent years, the Latino population in Orlando and Central Florida has markedly grown; Hispanics are now 25 percent of Orlando's residents. When tragedy struck, local organizations came together through coordination from the City of Orlando. Elda Rivera works for the Hispanic Chamber of Commerce of Metro Orlando and recalls an urgent need the city had- the need for translators. “We immediately used social media and got hundreds of people willing to help,” Rivera recalled. She also told NBC Latino of a big request from the Latino community in the area- there had been no vigils done in Spanish. The chamber immediately got to it. “It was a big effort but it was important for the Hispanic community to have a place where they could heal in their language, because they hadn’t had that yet," said Rivera. Ricardo Negrón also recalls the community's outreach efforts before Pulse. A voter registration event targeting prospective Latino voters was supposed to take place at Pulse the week following the shooting, said Negrón. “I figured Pulse would be an ideal place to reach out to the Hispanic LGBTQ+ community - something that wasn’t being done." Then the shooting happened. Negrón was at Pulse that night. He had arrived at midnight by himself, just in time to watch the drag show. He was able to escape after the shooter’s gun jammed. Like a growing number of Orlando's residents, Negrón arrived from Puerto Rico a little less than two years ago. The 28-year-old lawyer came to Orlando through an opportunity with AmeriCorps. His plan was to gain some work experience before taking the bar exam here. Ricardo Negron, from Somos Orlando. Negrón has taken his experience and put it into action as the program director for Proyecto Somos Orlando, which was created on the heels of the Pulse tragedy. Proyecto Somos Orlando came about as a joint effort between the Hispanic Federation’s Orlando office and other local-led Latino institutions such as the Hispanic Chamber of Commerce where Rivera works. Prior to Pulse, there were Latino organizations and LGBTQ+ organizations in the area, but not one that created a space for uniting and providing coordinated services for the different groups. Proyecto Somos Orlando has helped changed that. “Now there is an infrastructure that is geared towards the needs of the Latinx community,” said Negrón. This unity has also helped put a spotlight on the area's Hispanic LGBTQ community. Before Pulse, Negrón had come out to his immediate family and friends but now he is out on a bigger scale. “There’s nothing more out than being the director an LGBTQ+ program," he said. His family is very supportive of him and his mother even joins him at events when she comes to visit. She also enjoys sharing stories about his work on social media, although when he first came out to her she gave a “very telenovela Latina reaction,” Negrón recalled giggling. Though he is not practicing law at the moment, Negrón feels he is fighting for justice and what’s fair. Though on some days he still struggles and continues to see a counselor, he finds peace in the moments when he realizes the various programs offered by the organization are making a difference in the community. Due to costs and other circumstances, many of the victims' Latino families throughout the U.S. and Latin America did not get the chance to come to Orlando after the shooting, pay respects to their loved ones and see the memorial sites. The Orlando area was covered in rainbow flags and artwork by people who left behind a show of solidarity and love following the tragic event. The question became how could Latinos and other families abroad or elsewhere in the U.S. search for remembrances of their lost family members and find out what special messages were left behind for their loved ones. Family members had sent messages or artwork through friends and relatives; what happened to these items? That’s where the Orange County Regional History Center stepped in. The history center’s museum manager, Mike Perkins, gave NBC Latino a behind-the-scenes look at some of the over five thousand items collected since the Pulse massacre. It's an emotional but important task for the small staff of less than a dozen employees, Perkins said.The museum staff collected each item, brought them into the museum to dust off, assigned an item number, took a photo and placed them into acid-free paper and boxes. The staff even created custom compartments for some items within the boxes. 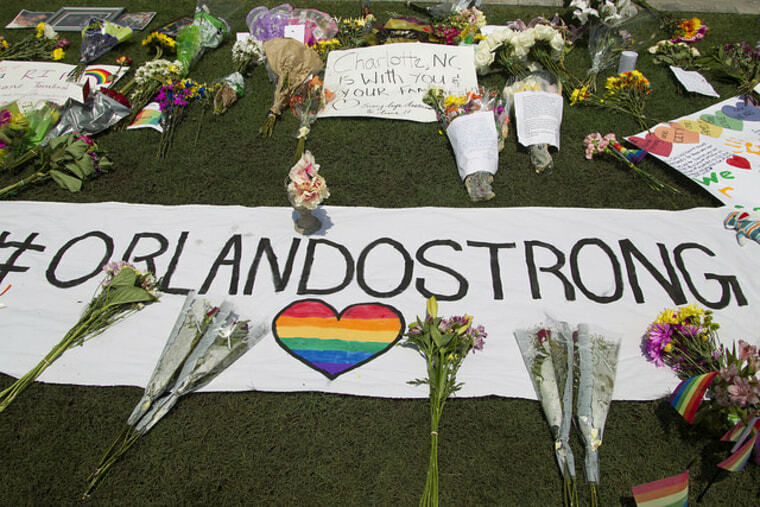 A number of the items are on the display at the museum, but loved ones anywhere will be able to go onto the museum’s website and search through the One Orlando Digital Memorial as of Monday morning, June 12th. Each victim’s name will be listed in alphabetical order so they can be easily searched and found along with pictures of items left behind for them. The digital gallery will have about 600 items and will provide multiple images of the items so people can read everything written on them as well. “[It] shows how much effort and love people put into creating these items,” Perkins said. The museum hopes people who placed things at the site or created them will also help them fill in some blanks in their database, this way they can get insight as to who created them and why. This digital repository is key for many of the area's Latinos, who have struggled to integrate family members from different parts of the country and Latin America who don’t have the means to come visit. It's a way of helping family members feel connected despite the distance. "You have to learn how to live"
But for Latinos in the area, the Pulse site, though painful, remains the place where their children, lovers, friends or parents spent their last moment. It matters to be there. Alvear says she will keep pushing through the pain and make sure her daughter’s legacy remains. Victoria Moll-Ramirez is producer for MSNBC who has been unhealthily obsessed with the band 'Aventura' since she was 15.